Try to figure this one out. I saw three of these driving in a convoy down the highway towards Hawgtown today. All of them had Minnesota licence plates. One of them was towing a car that had Michigan plates. USPS is outsourcing to CP. Next CIA will outsource to CSIS. FBI will outsource to RCMP. Betcha they are smuggling drugs and guns. 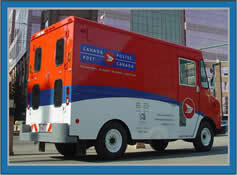 Who would suspect Canada Post? Larry, Harry, Barry and Terry have escaped. They're on the lam. BB, you can't possibly mean CIA getting CSIS to do their dirty work? Since the opposite was true in the case of Maher Arar...or was it? Who did whose dirty work there? And how come we can't get Stephen Harpie deported to Syria?